November, 2017. New York. Our scene opens on a man who is nearing the end of a grueling challenge. After months of careful preparation, scouting his course, training his body and mind, he nears his ultimate reward: history. He knows what he has to do, he knows who his rivals are, and he knows what kind of time he can achieve if he puts together the kind of run that he feels is possible. Then, ecstasy. He crosses the line, the timer stops, and he has it: a world record. He can now claim to be the fastest in the world. He is not competing in the New York City Marathon. That took place nearly a week ago. Instead, he is at home. 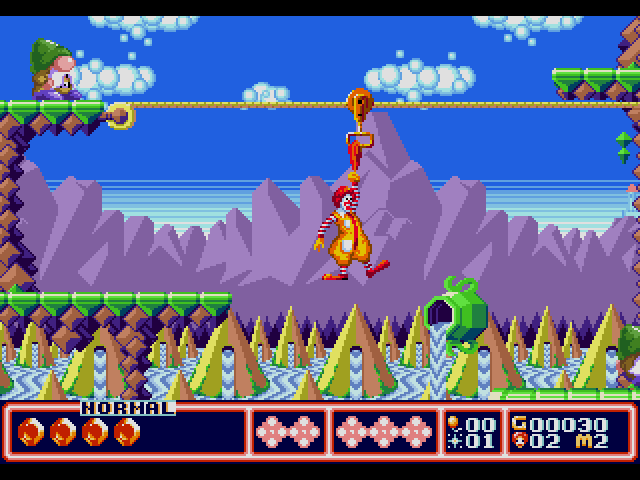 He has just completed a speedrun of the timeless classic known as McDonald’s Treasure Land Adventure, and he is now a record breaker. He goes by the handle Boon on Twitch, and he has brought his time from start to finish down to a scant 20 minutes, 10 seconds through a combination of timing, memorization, exploits, and consistent practice. Too dramatic? Maybe. Maybe not. Speedrunners are a fascinating breed. If esports athletes are the gaming world’s football stars, then speedrunners are its track stars. They work alone, rather than as part of a team. They spend almost unreasonable amounts of time working to shave seconds or fractions of seconds off of their fastest times. Most importantly, they prepare extensively for something which could be derailed completely by the slightest mistake. It will likely not surprise the reader to learn that the community for speedrunners of McDonald’s Treasure Land Adventure (released in 1993 for the Sega Genesis/Mega Drive) is not a terribly large one. However, it is enthusiastic. Boon tells me that he first discovered the game after watching fellow speedrunner DeathJohnson playing. As Boon himself describes it, “I decided to give the game a try and upon receiving it, instantly knew I wanted to bring the speedrun down to as fast a time as possible. So I played and practiced consistently for some weeks, and in this span of time new routing and skips had been found that had made a previously thought to be amazing world record clearly beatable.” This led to the speedrunning equivalent of an arms race, with Boon tying DeathJohnson’s record last May and the two of them trading it back and forth for some time. Eventually the story saw the entry of a third major player: WhoaConstrictor, who temporarily took the record for himself before Boon set his time in November. That time still stands today. Boon has since moved on and has most recently been featuring the somewhat more popular Super Mario Odyssey on his channel, but stands ready to return to McDonalds if he is called to. While he feels his time is as fast as he is capable of going through the game, he told me that he plans to defend his record if anyone else manages to top it. As for the future, Boon is hopeful that he will get the chance to reproduce his record-setting run during the next airing of Awesome Games Done Quick, the semiannual speedrunning charity stream which raises money for the Prevent Cancer Foundation. Boon admits that another goal of his is to become sponsored or recognized by McDonald’s, but despite doing the legwork on social media he has not yet received public recognition for his feats in their game. On top of this, Boon has been striving for recognition for his peers. When I spoke to him online about this piece, he was clear that he was excited for what any exposure could mean for the McDonalds Treasure Land Adventure community. Boon himself spent around 40 days at the end of last year sending daily tweets to Kotaku seeking recognition for his record, and has since moved on to daily tweets directed at Polygon (he is currently on day 22 of his vigil).